I’ve written previously about the connection between infomercial celebrities and The Learning Annex. Apparently this was not a one-time fluke. The current issue of the The Learning Annex catalog for San Francisco is promoting their “Real Estate & Wealth Expo” and on the cover are three men who have appeared on infomercials. 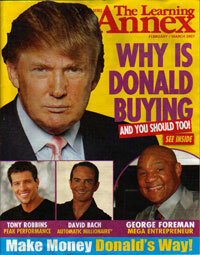 Looming above it all is Donald Trump who is joined by Anthony Robbins (Personal Power, Get the Edge) and George Foreman (Lean Mean Fat-Reducing Grilling Machine). Another person who might be considered D-List royalty under this equation is Matthew Lesko, who has taught a class at The Learning Annex and has recently made an appearance as a member of “The Mob” on the game show 1 vs 100. There may be other people who fulfill all three parts of this equation, but it’s hard to find out if someone has ever taught a class at The Learning Annex (Ron Jeremy? Miss Cleo? ).